Restore that pristine look to your suede, nubuck and canvas shoes! 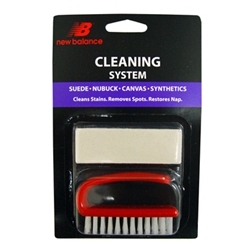 New Balance Suede Cleaning System cleans stubborn stains. Removes crayon marks from painted walls and heel marks from floors. Use the suede bar and brush on shoes, boots, coats, and luggage etc.